When we discovered this range of natural wooden animals and vehicles we were very impressed with how beautiful they are. 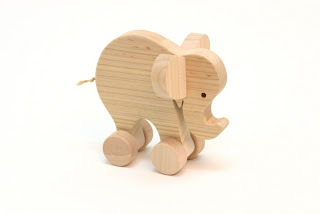 Each wooden toy is lovingly made in Europe from beech wood, cherry, walnut or mahogany. They are really well made and a lovely toy to pass down through the generations. Made from sustainable wood and only packaged using recyclable materials, these toys are also eco friendly. Perfectly natural with no paint, varnish or anything toxic, giving you piece of mind. My two favourites are the ones pictured. The elephant on wheels would make a lovely christening gift for a girl or a boy. It's sticking out ears and string tail make him a friendly character that children will love. 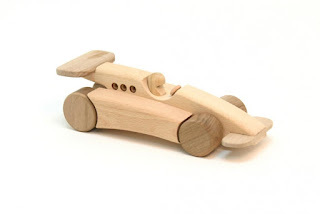 The other picture is of the racing car which is made from two different coloured woods. This wooden toy is so beautiful that not only would a child have fun pushing it around the floor but it would also look good on a racing fanatics shelf. Due to the natural shades of wood each toy is slightly different and would make a unique gift. There are also limited numbers of each available as they are made by a small family company so if you want one for Christmas don't delay. Are there more pictures of the car? I'm an engineering student and our final project for the quarter is to make electronically create a bluprint and 3d model of a wooden toy. The car is just the coolest thing ever. If i could find some more pictures that would really help.